Porter Wagoner remains one of the legends of country music as well as a Grand Ole Opry ambassador. Porter Wagoner and his broad smile, flashy costume and memorable songs are the very image of a country music star. Indeed, he is an icon in the music industry. 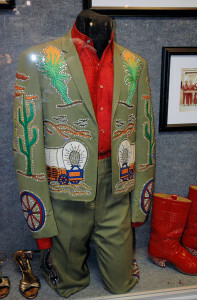 One of Porter Wagoner’s many Nudie’s Rodeo Tailors suits that he so famously wore during his career can be seen on display at the Willie Nelson and Friends Museum in Nashville, TN. The “Thin Man From West Plains” (Missouri), is among the most recognized names and images in all of country music. His grand showmanship, his rhinestone suits, his loyalty to the Grand Ole Opry, his TV leadership, his championing of Dolly Parton, his unique singing voice, his exquisite recitations, his songwriting, and especially, his record production, have all culminated in the legacy that is Porter Wagoner. Porter Wayne Wagoner was born August 12, 1927 of Irish-German heritage in the Ozarks of Missouri near the Arkansas border. In 1949, Porter visited Nashville and witnessed Hank Williams singing “Lovesick Blues” at the Grand Ole Opry. By 1950, he was working in Vaughn’s butcher shop on the town square and singing (and reading commercials) on a 15-minute early morning show over local radio KWPM in his hometown. Executives from Springfield, Missouri’s KWTO radio station then recruited him for their station in September 1951. Recognize the singer in the middle? Yes, it’s Hank Williams, Jr. prior to his tragic mountain climbing accident. 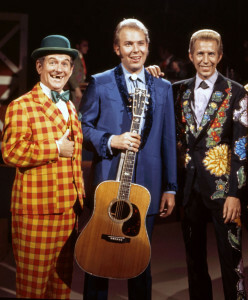 Pictured alongside Porter Wagoner and comedian Speck Rhodes. In 1952, Porter found himself recording his first RCA release, Williams’ “Settin’ The Woods On Fire”. 1953 brought Porter his first songwriting success with the Carl Smith hit, “Trademark”. During this time the Porter Wagoner Trio, with Don Warden (steel guitar) and Herschel “Speedy” Haworth (electric guitar) was formed and began touring. 1954 brought Porter his first top 10 hit with “Company’s Comin’”. “A Satisfied Mind” came next and went to number one for 4 weeks and stayed on the charts for over 8 months. In 1954, Porter became a part of the “Ozark Jubilee” and on February 23, 1957 he joined the “Grand Ole Opry” where he remains one of its most popular stars. Television has also been a major part of Porter’s time in the public eye. He started the syndicated “Porter Wagoner Show” in 1960 and it remained on the air for an amazing 21 years airing in close to two hundred markets and seen by an estimated 3.5 million viewers. 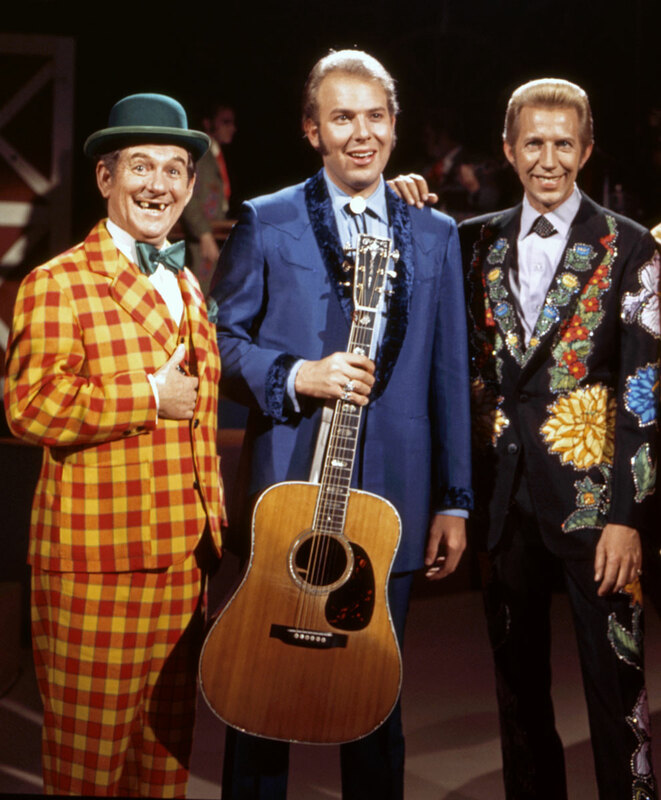 The “Porter Wagoner Show” was a key factor in popularizing country and gospel music across the United States. Throughout the 1960’s, there were lots of hit recordings and television work. In 1967, after seven magical years together, Pretty Miss Norma Jean left Porter’s show to get married. Early September of that year brought a fledging female singer named Dolly Parton as Norma’s replacement. You can still view these great shows each week on the RFD-TV network. In the next few years “Carrol County Accident” became a standout country hit and crossed into the pop charts, earning Porter a Grammy nomination and 1969 CMA “Song Of The Year” honors. 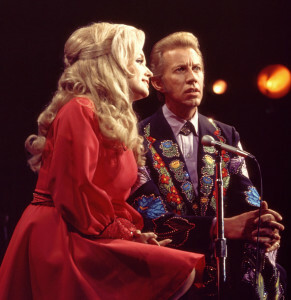 Porter and Dolly duets became increasingly popular, earning nominations and awards from the Grammys, CMA, ACM, MCN and a host of other awards shows. In 1965, he helped create another country and pop standard, “Green, Green Grass Of Home”. There have been over 500 versions, but Porter’s was the first hit. Porter’s career was on a definite upswing in 1969, when he won his third Grammy for “Best Gospel Performance” with the Blackwood Brothers. Porter Wagoner singing with his great partner Dolly Parton during the peak of their duet career together. The 1970’s brought more hit records (with Dolly and alone) and more television. In 1979, he hosted “The Godfather Of Soul”, James Brown at the Grand Ole Opry. In the 1980’s Porter landed a role in the movie, “Honkytonk Man” with Clint Eastwood. he 1990’s brought the Nashville Network and even more television work and appearances on the Grand Ole Opry for Porter. With the new millennium under way, Porter received his highest accolade with his induction into the Country Music Hall Of Fame in 2002. Porter has been awarded four Grammy awards. Three of which were won for his work in gospel music. Gospel music has, in fact, always been at the heart and soul of his legacy. January 2006 brought the third installment in the highly successful recordings with a country/gospel flavor. “Gospel 2006” and the first single, “The Dream (A True Story)” is getting great reviews, charting positions and airplay from many top Classic and Christian Country radio stations all across America. Porter was not one to brag, but he is widely acknowledged by new country performers as the epitome of showmanship. Those who are truly trying to learn the business, watch him to see how he puts on a total show, making everyone in the audience feel special. He wouldn’t say he’s doing anything special, he’s just being himself. Unfortunately, Porter became ill in early October, 2007, and was admitted to the hospital on October 15. He was diagnosed with advanced lung cancer, and passed away peacefully on October 28, 2007. Country music lovers and the Grand Ole Opry will miss not only Porter’s music, but also his stage presence and his infectious smile. 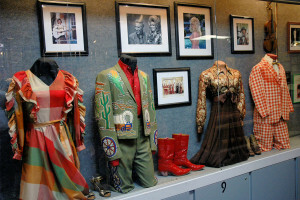 The Porter Wagoner TV show exhibit on display at the Willie Nelson and Friends Museum in Nashville, TN. 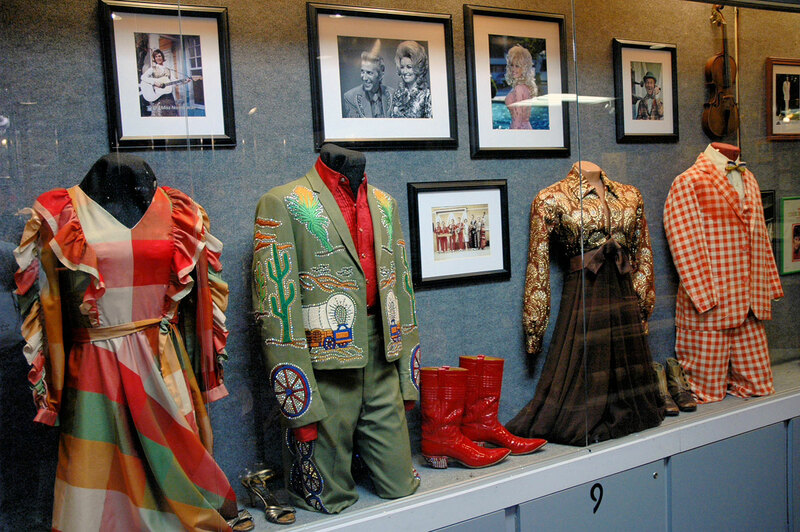 In Porter’s honor, we’ve created a special display in the Willie Nelson museum dedicated to Porter Wagoner. We also have a lot of photos of him scattered throughout the store and museum. So be sure and stop in – you’ll love it if you’re as much of a Porter Wagoner fan as we are.